At 37, Jennifer Chau is living her best life. If only she had known about HERS earlier, she would be living even a better and healthier one. With a supportive husband and a 19 year-old son, this beauty consultant for La Mer at Nordstrom, has fallen in love with HERS. She finds it a rush and it’s addicting. It is something she can’t get enough of. Like most HERS clients, she found it a challenge at first. However, it was so different than what she knew at Goodlife. She worked out at the Markville co-ed location because it was nearby and because her husband could go with her. “I always went with him. Otherwise I found it too intimidating.” Her husband is a bit of a fitness freak so he trained Jennifer whenever he could. They worked on the machines a lot so she never experienced the camaraderie and rush of a group class. Though his advice was sound, the atmosphere wasn’t the same as this all-female environment. There is certainly something to be said about this level of comfort and familiarity of the coaches. It’s great to have a coach to identify with and they know your progress level as you develop over the months. For Jennifer, discovering HERS was a group effort. One day, she just decided she wanted to try kickboxing and she found HERS. She invited her sister and a friend. The friend had a sister and then more people were invited so the orientation became a small in-house party. The party was pretty good for most of the ladies who tested it out in spring 2018 are now regular members. Jennifer loves her food as we now follow each other on Instagram. What is life without the pleasure of delicious meals? Now because Jennifer works out so much (she started off with 8 classes a month and was on the unlimited program in October and November) and challenges herself all the time, eating doesn’t come with the guilt. She can enjoy her desserts and noodles with ease. She has always enjoyed hiking and continues to pursue badminton with her husband. She uses the heart monitor to push herself and doesn’t focus much on other people’s numbers. She says that if the monitor makes you do better then use it. It is all about challenging yourself. 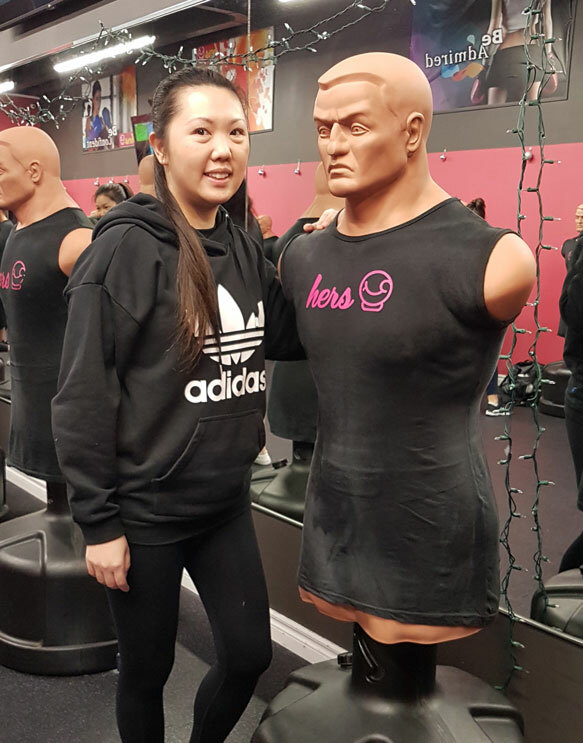 One of Jennifer’s favourite instructors is Suzanne despite finding her intimidating at first. Now she sees that she is hilarious and fun. “She doesn’t scare me anymore. She makes me want to do better.” Suzanne has choreographed the routines to maximize muscle-building in a short amount of time and the results show. Jennifer wasn’t able to do push-ups before and now she can. She has a ways to go, but at least the progression is there. Jennifer is proud of her achievement and the HERS team is too. Keep at it! Jennifer can’t decide which class is her favourite, but she did say that Box Training was tough. It happened to be the very first class she had after her orientation and she still remembers it to this day. “The ropes, the moves, it was really hard. It was my first burpee.” However, we at HERS know she has learned a lot over the past few months and she is open to trying it out again. She has pushed herself more than ever with a couple of back-to-back classes and some 6:15 a.m. This system not only has helped her lose weight and gain muscle, the confidence level has risen quickly too. Jennifer, if you’re ever up for another go at Box Training, I’m your girl.